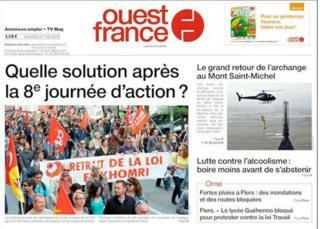 Image caption France's top-selling daily Ouest-France asks "what is the answer, after eight days of protests?" The strikes and protests over labour law reforms dominate all the front pages of French newspapers today, and there is little optimism on left or right that an end to the crisis is near. Newspapers have reappeared after the CGT union stopped the presses of all but the pro-communist L'Humanite yesterday, when they refused to run an opinion piece by CGT leader Philippe Martinez. France's best-selling daily, Ouest-France, asks: "What is the answer, after eight days of protests?". Like many papers, it sees the government and unions locked in an "arm-wrestling match", with few signs of avoiding the "great day of national protest in Paris on 14 June", the day after the bill goes before the Senate. The headline in left-leaning Le Monde says the government is "seeking a way out of the Labour Law crisis". It runs articles for and against the strikes on its opinion pages, with sociologist Daniele Linhart seeing the strikes as a "rejection of the managerial concept of labour... that depresses wages". On the other hand, Raymond Soubie, an aide to conservative former President Nicolas Sarkozy, says the strike is no more than "weak social agitation", accusing the CGT union of "concentrating its action in sectors where it is strong, to give the illusion of breadth". Le Monde's reporter Jean-Baptiste de Montvalon thinks the government has already lost the battle for public opinion, marshalling the results of several polls suggesting that a clear majority of voters blame the government for provoking the strike. He acknowledges that low rates of union membership have left the CGT weak, but the government's "record unpopularity and divisions", and the way it has handled the labour law, leave it "little hope for recovery". The conservative daily Le Figaro highlights "anxiety" in the governing Socialist Party over Prime Minister Manuel Valls' "intransigence"
Its front-page editorial criticises a "two-speed France" where public-sector workers lag far behind private employees in their number of working hours. It says the latest report on the topic, commissioned by the prime minister, "has joined the vast graveyard of reports on this waste of public money". Le Figaro, like many other papers, asks whether the country will run out of petrol this weekend as the unions "seek to widen their action". Pro-communist L'Humanite says it is "naturally on the side of the opponents of the Labour Law...in solidarity with the workers against the arrogance of the powerful". It is confident that the strikes will succeed, as the "union front has split the governing clan". Image caption Left-wing Liberation's arresting front page sees protests, and asks "Where's the way out?" Left-wing Liberation's arresting front page sees protests "continuing unabated" and, like many papers, asks "Where's the way out?". It portrays a "government tying itself in knots" through the "president's indecision and the double talk of his colleagues", which sends out an "unclear message" as to whether they want to stand firm or compromise with the strikers. Liberation's editorial fears that the standoff could derail the provisions of the law that are set to improve employees' rights. "We need to remember that the other major union, the CFDT, wants these measures passed quickly, in case a right-wing government takes over from Manuel Valls next year". It calls for talks to resume "not on the pavement after a protest, but in the appropriate place for drafting laws - parliament". French strikes: Does France's workforce really have it easy?